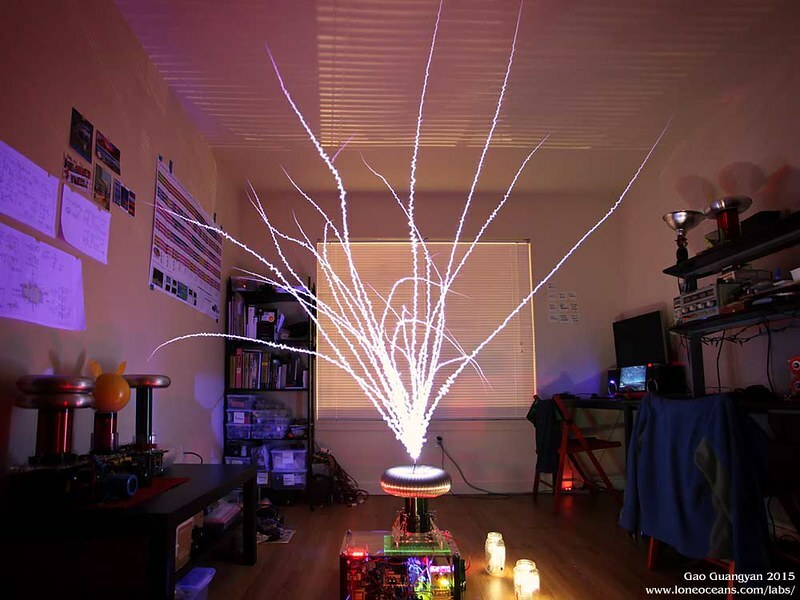 "The QCW, or Quasi-Continuous-Wave DRSSTC is a variant of the Double Resonant Solid State Tesla Coil and is characterized by its ability to make extremely long, straight sparks. In 2013, I started building my first QCW DRSSTC (QCW 1.0 - see this page where I have documented in more detail the theory of operation, as well as its construction progress). I successfully demonstrated proper QCW operation and achieved a >1m long spark achieving the goal for the project. 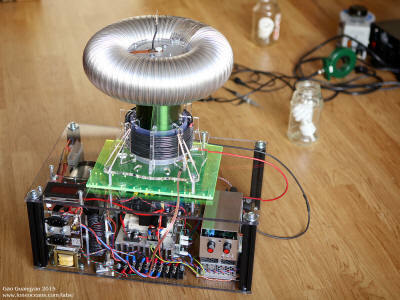 Being perhaps the first comprehensively documented build of a QCW coil on the internet at time of writing, my original QCW 1 project page turned out to be extremely popular, and I've been contacted by numerous hobbyists on questions and comments, and have received several messages from people who have successfully replicated the project! So here's a shout-out to all my readers for your support, and I am glad this website has been a useful resource. 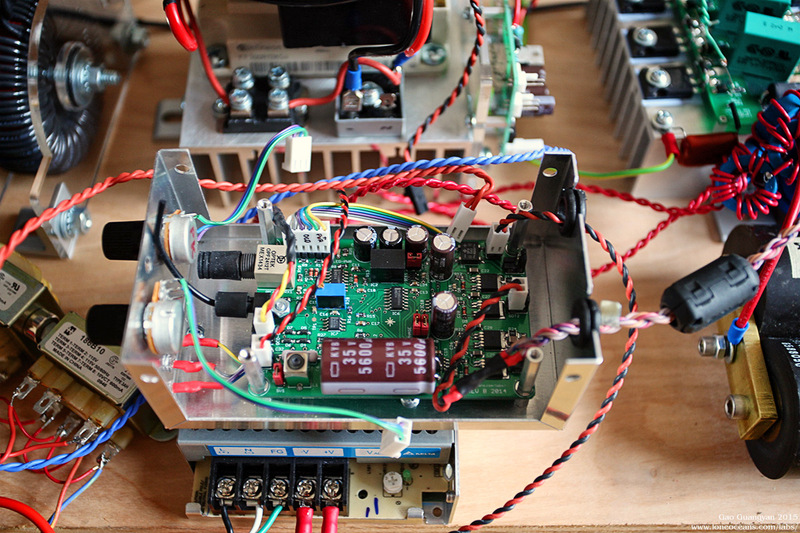 As part of this project, I developed a few boards such as the EasyBridge and the BrickDriver. For those interested, I have them available if you'd like to incorporate them in your project! For this continuation of my QCW 1 project, I have set a few new goals to improve the performance of the original version 1.0 QCW. This project will also likely be the basis for a possible future QCW 2. This page will be a little be haphazard as I conduct different experiments and test to figure out what works and what doesn't. The Goal of QCW 1.5 is to achieve a 10x spark to secondary coil ratio at a driving current of below 200A. 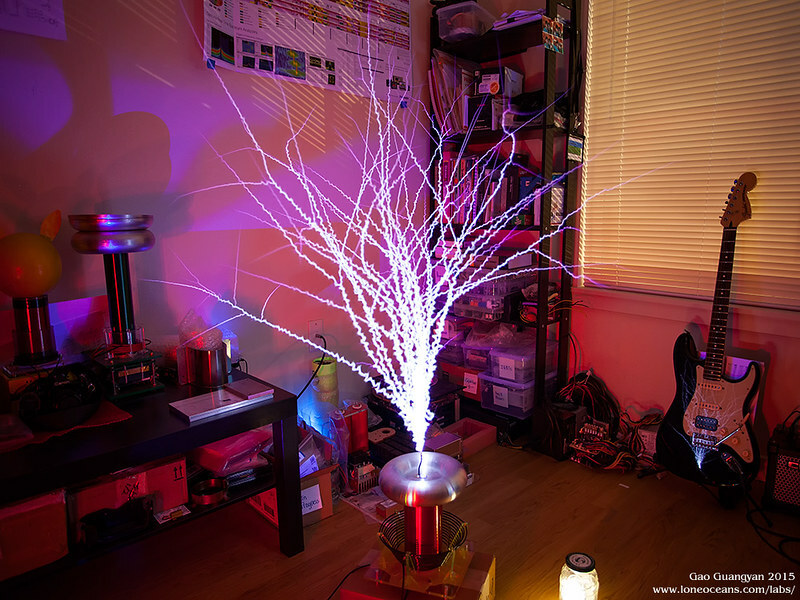 Results (June 2015): Just over 70 inch spark length with 5.55" secondary coil! 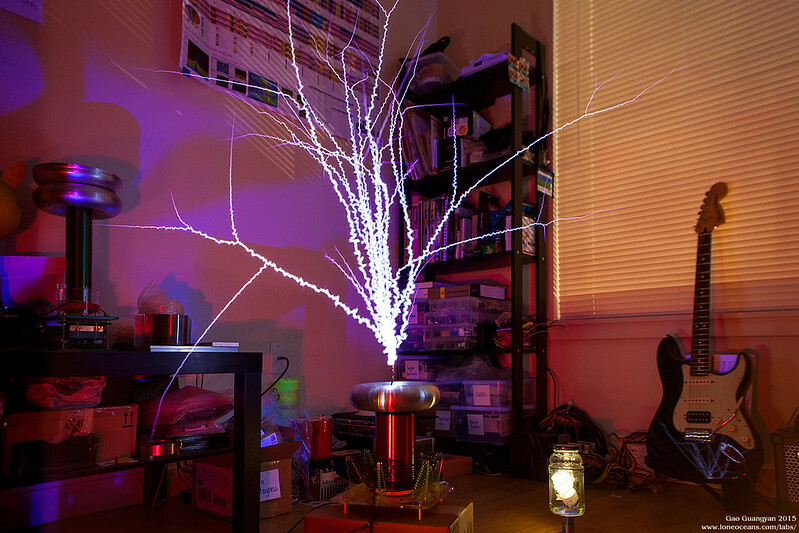 The newest frontier of Tesla Coils in the modern age is the QCW DRSSTC, capable of generating huge, long sparks with some clever drive techniques. Since this is a continuation page, please read my QCW 1 project page to learn more about QCW operation. In this section, I will focus the main changes I have planned for QCW 1.5. Building on the success of the original QCW design, I wanted to push it a little bit further and try out some new things as an experiment for future projects. The QCW Tesla Coil can be broken down into three main parts - the buck converter, the DRSSTC, and the ramp generator. Let us look at these parts separately in more detail. Note that this section contains my initial plans (end 2014/early 2015) and final specifications might change as the build progresses. QCW 1.5 will retain basically the same bang-bang feedback controller I developed for QCW 1. However, I was never really happy with the implementation of the power electronics. Instead of using two TO247 IGBTs and separate diode, I decided to give a new general purpose brick-IGBT driver I designed earlier on last year a try, and use a large half-bridge IGBT module for the main switch instead. A half bridge module is particularly suited for this task because it contains two IGBTs with reverse diodes in a single low-inductance package. This also means less wiring on my side. The idea was to use the upper IGBT as the main asynchronous buck switch, and the bottom IGBT forced open, using only the reverse diode as the main buck diode. This is a bit wasteful, and in real life, one can buy IGBT modules with only an IGBT and single Diode (in upper and lower switch configurations) for cheaper than a new dual-switch. But I did have a bunch of half bridge surplus modules lying around, so my choice was driven simply with what I had on hand. 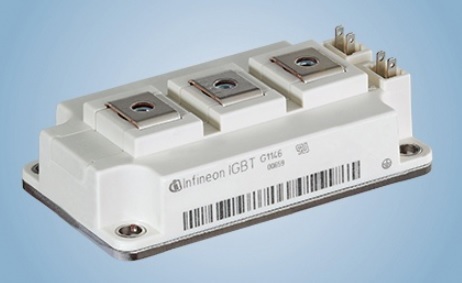 This IGBT uses Infineon's own NPT IGBT2 chips for high frequency switching (S series Fast Short-tail IGBT chip), similar to the Semikron 125D line, with a square RBSOA good to 600A at the low voltage (<400V) we are running at, and has supposedly 'unbeatable robustness'. The driver will be my custom IGBT brick driver which I developed a while back, with desaturation detection and good for up to 600A+ IGBTs. Because this is a bang-bang controller, switching frequency will vary depending on the feedback parameters and I'll be adjusting it to be around ~5 to 30kHz, comfortably within the IGBT's datasheet capabilities. In the version 1 QCW coil, I had quite a bit of problems keeping up with the long pulse with my small 3400uF bus capacitor, so the capacitor will be upgraded to a single 400V 10,000uF bus capacitor, charged up to 340V from 240VAC rectified, with a ramp peak at around ~300V. This should be an improvement over my 1.0 QCW which made ~1 to 1.2m sparks with a 150V ramp before the capacitor voltage dropped too low. In the future I might have to either use a buck boost topology or a higher voltage bus capacitor to better make use of the energy stored in the capacitor. The DRSSTC portion for QCW 1 performed admirably, but there were several things I wanted to change / experiment with. There were two main experiments I wanted to try. Below is an outline of my plans. Go on to the results section to read about the results :-). Due to an oversight on my part when calculating the resonant frequency for the version 1.0, I wound up with a base resonant frequency of 400kHz, which at upper pole operation, resulted in an actual QCW 1 upper pole operation frequency of 460+kHz. This is beneficial for sending power into the secondary, but stresses the main IGBT bridge more due to the high switch frequency. I was also at turn 7.5 out of ~12 turns on my primary, so I knew I could drop the frequency significantly to reduce IGBT switching losses and have lots of tuning space to spare on the primary. Experimentally it seems that for straight-spark growth, a frequency of 300kHz or higher is required. Therefore I decided to make a new 3.5" x 6" secondary coil wound with about 840 turns of AWG 34 wire with wire insulation taken into account. With the same parameters for the rest of the coil, this should drop the new resonant frequency to 290kHz, putting the upper pole somewhere around 350kHz. 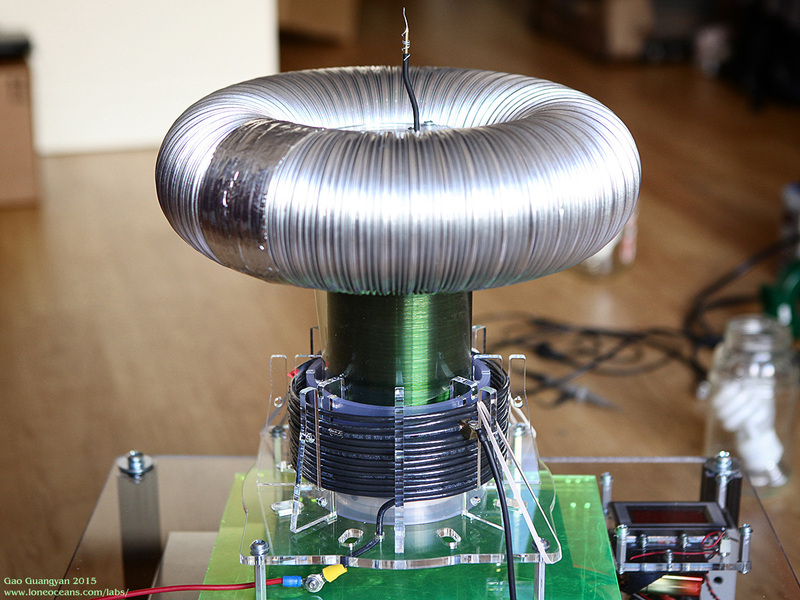 Results (May 2015) - New secondary coil and 8 x 2" toroid operated around 300kHz. Together with the conical primary at ~turn 10, the system resonated at the upper pole of 360khz with a coupling of 0.308k, and operating frequency dropped to 340kHz with a ~200V ramp at around 150Apk. Ramps of 10ms consumed about 78J per burst, with a longer 15ms ramp producing significantly straighter sparks. Spark length achieved was about 1.2m. It seems that spark de-tuning is significant and causing excessive primary current and therefore less efficient power transfer. 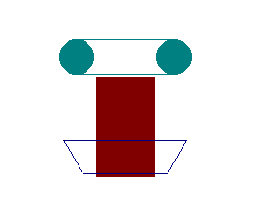 Experiment 2 will instead focus on a new design with a larger toroid and higher coupling. The game plan is to improve impedance match between the driver and the spark to more effectively send power into the spark as it grows. My original conical primary coil had a coupling of around 0.3k, and I wanted to increase this to closer to 0.4k Hence I designed a new cylindrical primary coil. The idea is that while this will shift the upper pole higher away from the secondary frequency, the overall detuning after spark loading will be proportionally less. To maintain a good operating frequency, I will revert back to the original green secondary coil but add a new larger toroid made of 3" ducting, for a new f_sec around 340khz. 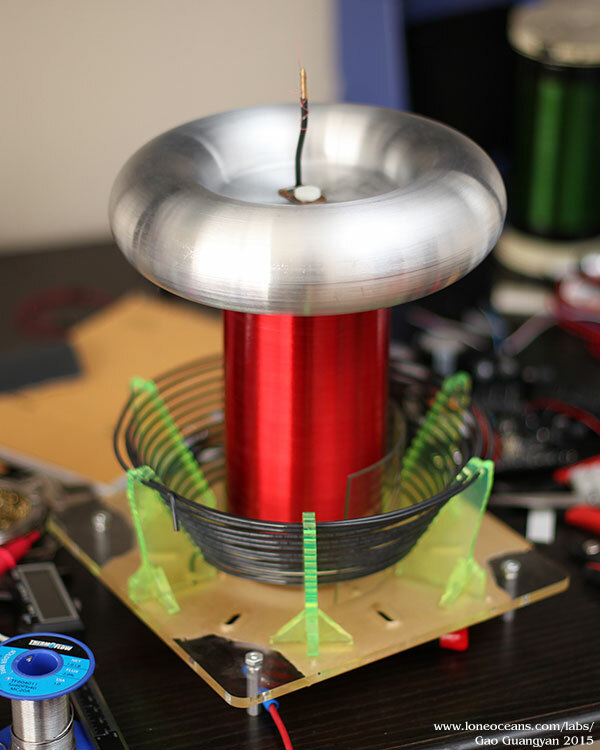 This experiment will be conducted with the primary set to as low as possible while still kicking the coil into the upper pole, and current limit to be set around 160A. 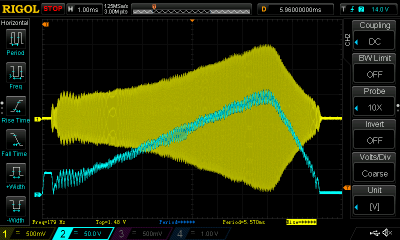 Results (June 2015) - Experiment 2 turned out to be excellent, resulting in exactly the impedance matching I was looking for. The results are obvious. 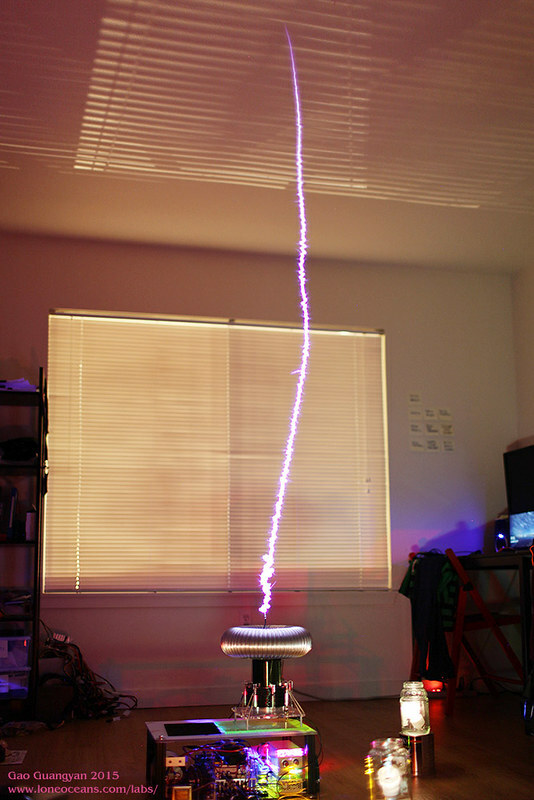 With the secondary coil around 340kHz and a coupling of around 0.38, the coil self-oscillates around 413kHz and drops to about 376kHz or so (depending on the actual spark), with a measured spark length just over 70". Maximum ramp is just over 300V before my bus cap (charged to ~380+V) drops too low. At the peak of the ramp, primary current hovers between about 145 to 160A. 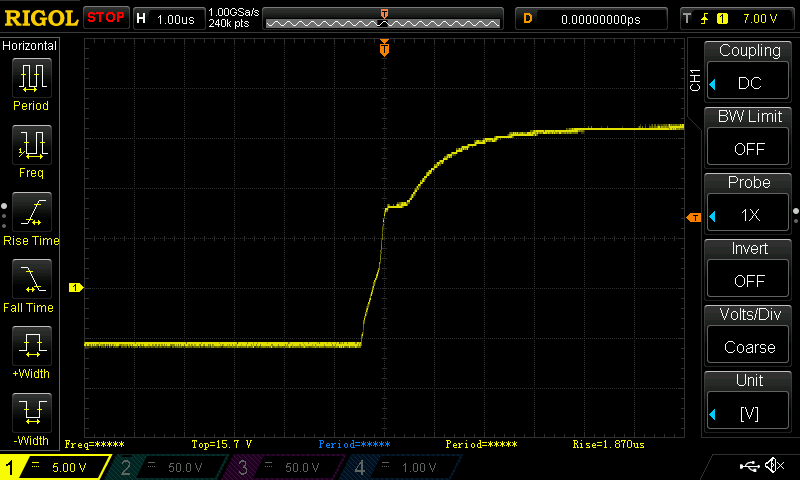 Total pulse length for a good spark growth is about 22ms with the rising ramp about 16.5ms rising up from ~75V. Pulse energy is just around 275J. At this point, the project has exceeded its goals! Measurement (27th June) - Bus cap charged till 397V, dropped to 326V after one pulse (256J). Primary current ranges from 148 to 165Apk. 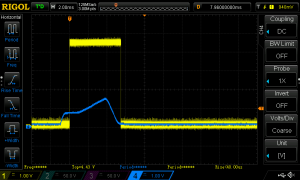 Current initially ramps up to about 75A in the first 640us (with a 75V bus). Once the coil begins running (the 'wick' phase), bus voltage drops to around 50V (60A primary current) before ramping up to just around 300V. Buck switching frequency begins around 13.6kHz going up to a maximum of around 29.7kHz, and then to 19kHz at the peak of the ramp. Total wick duration lasts for about 1500-640us. Peak reached around 17.7ms, and ramping down to 25V at 22.5ms. 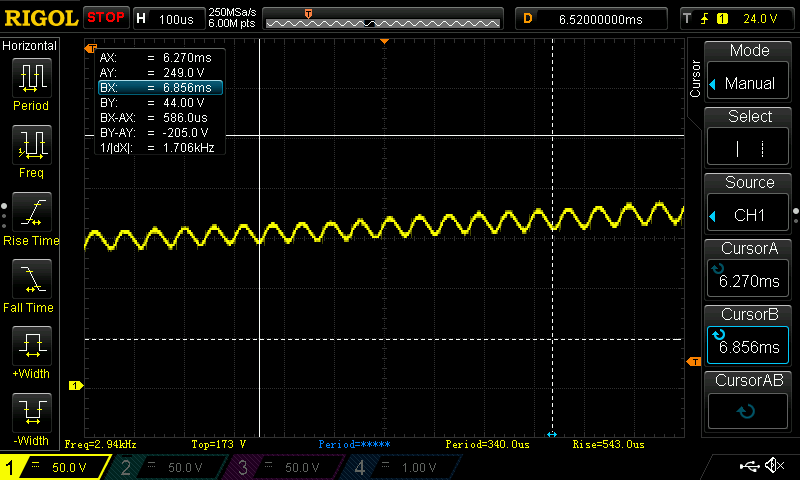 Turning off the coil results in a small voltage jump to 80V before it decays down. The bridge will continue to be the same bridge made of the fantastic Warp2 IGBTs from IR, but this time I thought I'd re-wind the GDT to use a single large GDT core, with a +-24V IGBT gate drive from my UD2.7. The ramp generator will be exactly the same. To simplify things a bit, I decided to put the microcontroller on the tesla-coil side, and this the user will be able to control the pulses sent to the coil instead. I also added Bluetooth capability so the coil can be controlled via a smartphone, but this is more of a gimmick than anything, if it actually even works :-). Otherwise fiber-optic is still the way to go. The secondary circuit in QCW 1.0 resonated closer to 390kHz, and in upper pole mode operated closer to 465kHz. For the first experiment, I wanted to try with a lower frequency secondary coil, so I made a new secondary coil with the same 3" PVC pipe (3.5" outer diameter), with red AWG 34 wire. This has a nominal thickness of 6.3 mil, but with wire insulation should bring the actual diameter to ~7.3mil. For a 6" winding length and a 99% fill, this would give me about 822 turns. I managed to wind the coil on the lathe with automatic feed, which despite the thin 34 AWG wire, went quickly in just 20 minutes. The final actual winding length measured around 6.3". End caps were made from acrylic, with holes drilled and tapped to accept 6-32 nylon screws for attaching it to the pipe. The coil was then given 3 good layers of Minwax clear gloss polyurethane, which is my favourite varnish for finishing coils. Next was finding the actual resonant frequencies to characterize the system properly. Primary alone on a cardboard box with no secondary - 321kHz @ 9.5, 306kHz @ 10, 291kHz @ 10.5. The coupling of two resonant systems results in an overall frequency response with two resonant peaks, and can be calculated based on the geometry of the system via the coupling coefficient k. At turn 10, the coupling of my system was calculated to be k=0.306. ..where f_natural is the resonant frequencies of the primary and secondary circuits in isolation. The calculation of different resonant frequencies is more complex and left as an exercise for the reader. Using f_natural = 302.7kHz, the calculated poles are 363khz and 265kHz, which are in reasonable agreement with the measured poles at turn 10 with a grounded secondary. Overall the new secondary system turned out exactly as I had planned with a ~300khz operation frequency. The toroid can actually be lifted up to further drop resonant frequency (e.g. lifting it up by an inch drops f_sec to 300khz). The resulting coupling coefficient is lower than I was hoping (wanted closer to 0.35 to 0.4), but a new primary should be straightforward to make if required. New Larger Toroid aka. "FAT TOROID"
For experiment 2 I wanted to make a new secondary system with a lower ~340khz frequency but with a larger toroid. For this system, I went back to my original 32 AWG 5.55" long secondary coil used in QCW 1.0, together with a new toroid made out of out of 3" PVC ducting. The ducting was larger than I had thought and the result is a 3.4 x 11.25" toroid, which looks a bit wonky on the small secondary coil since it's twice as big as it is! Because of this I will call these setup the "FAT TOROID" setup. 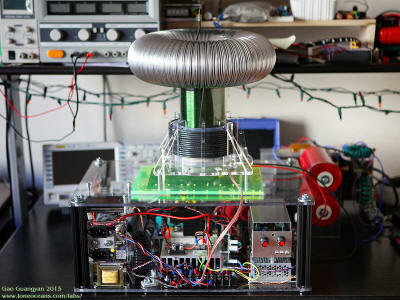 I also made a new primary coil out of AWG12 wire with a 5.26" diameter. The coil was tapped around turn 10 for a resonant frequency around 330kHz. To simplfy construction, I designed the mounts and laser-cut them in acrylic. Putting everything together went quite quickly as can be seen above. Here are the resonant frequencies as measured. Primary at various frequencies (turn 12.75 - 274kHz measures, 273.9kHz simulated). 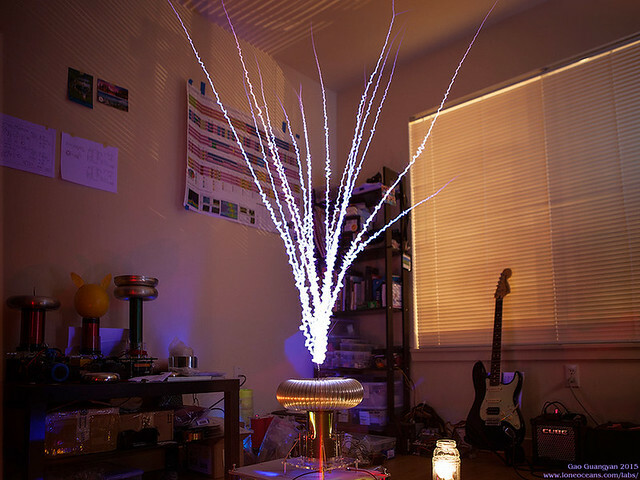 This setup will be used in the 2nd experiment. 1. Setting f_pri = f_sec. This can lead to natural excitation of both pole frequencies, leading to notching in current at the beat frequency, and is therefore not ideal. 2. Setting f_pri < f_sec. This causes the driver to oscillate at the lower pole. 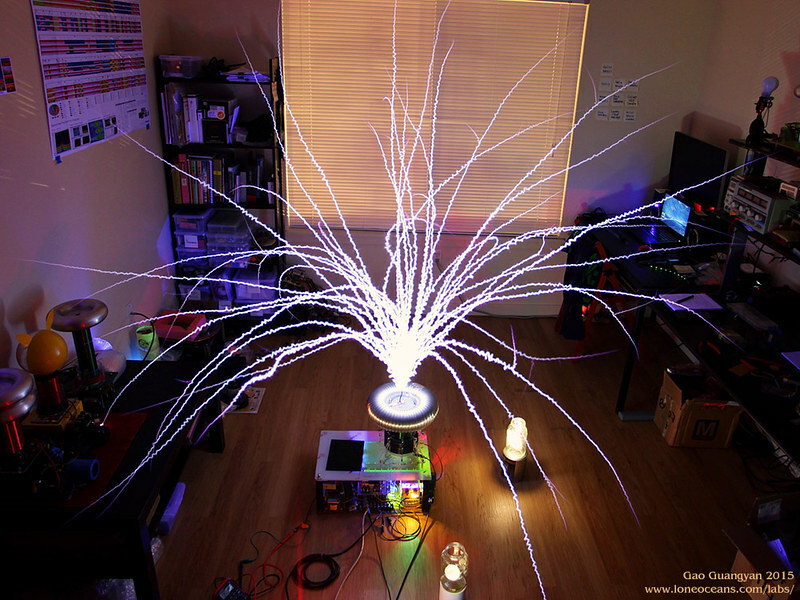 As the spark grows, the secondary frequency drops due to spark loading. This causes the system's lower pole to drop further; the the coil begins out of tune and continues to be more out of tune - not ideal as well. 3. Setting f_pri > f_sec. This causes the driver to oscillate at the upper pole. However as the secondary freq drops, the system's upper pole also drops but now brings the system closer in tune. This is however still not the most ideal, but is the best of the 3 options. So Option 3 is the best method for conventional tuning. However, the coil still goes out of tune and becomes quite inefficient, resulting in more energy stored in the primary instead of the secondary circuit. However, a tuning trick allows us to avoid this. For example, in a conventional upper-pole tuning, Steve's QCW 1 required about 280A for 6 foot sparks, and maybe 200A for 5 feet. Zrg's QCW also required about 300A to make 6-7 feet sparks. 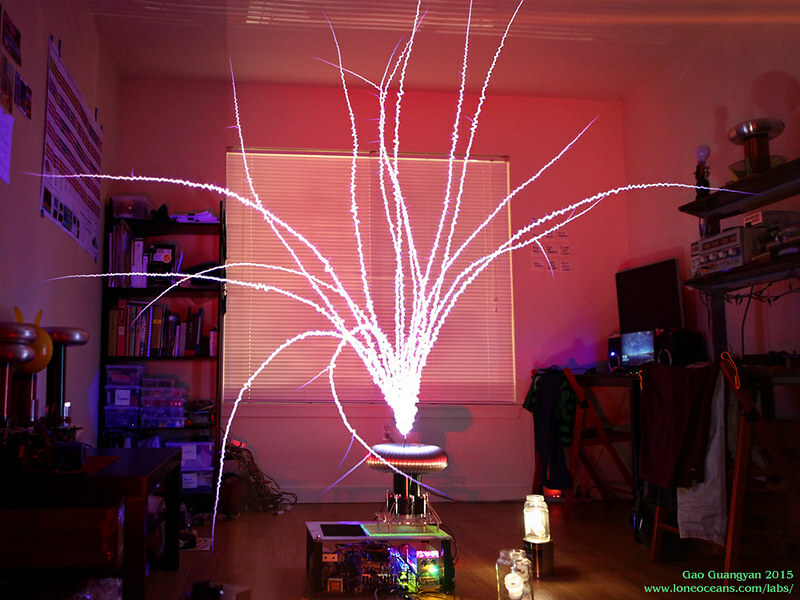 However with the tuning trick, it is possible to generate 5 foot sparks with just 110A. 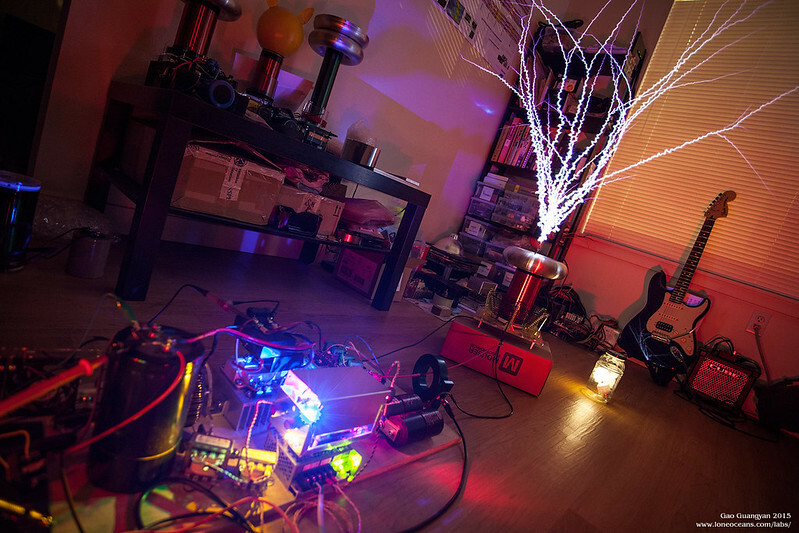 Otherwise I'd expect ~150A to be only about to make roughly 4 feet sparks. 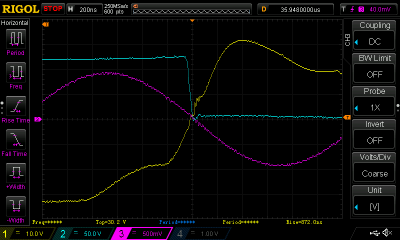 The trick is to tune f_pri to lower than f_sec, but drive the coil at the upper pole. Now what happens is that as f_sec drops, the operation system frequency drops and and the coil becomes more and more in tune as the spark grows, allowing power transfer to the spark. However this cannot be natively done on a conventional feedback driver; there must be some sort of starting oscillator to kick the coil into a different pole operation before feedback over-rides the start-up oscillation. .. where B is the flux density in Gauss, A_core is in cm^2 and "ET measures the energy-handling ability of a transformer or inductor, and depends on core area, core material, number of turns and the duty cycle of the applied pulse" - (information from powerelectronics.com). To prevent the core from saturating, we need to use a minimum number of turns. We can calculate the flux density B = (V x t) / (N x Ae). Although B=0.46T, we can be conservative at set maximum B to be 0.2T. 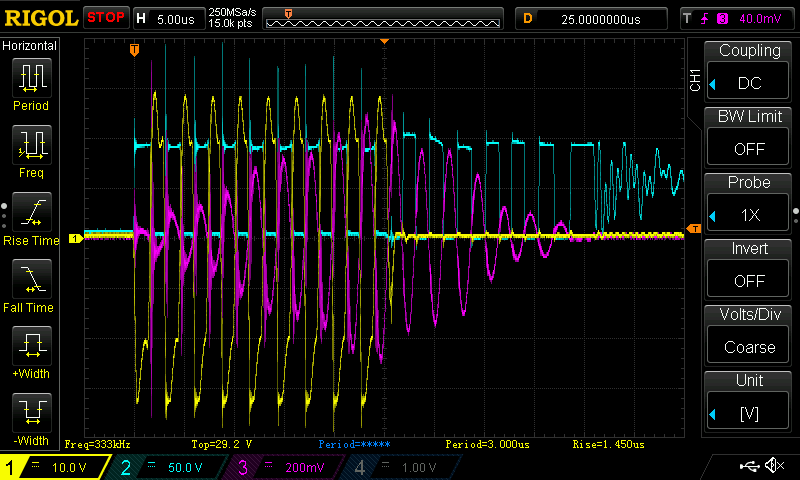 Now V = 24V (we're using a 24V 50% duty cycle gate drive at say 300khz). This gives us an on time of 1.67x10-6s. Note that Ae = 1.253x10-4. Re-arranging, we see that N = Vt/BA, and the minimum number of turns to avoid saturating the core is 1.6 turns! So no problem here. 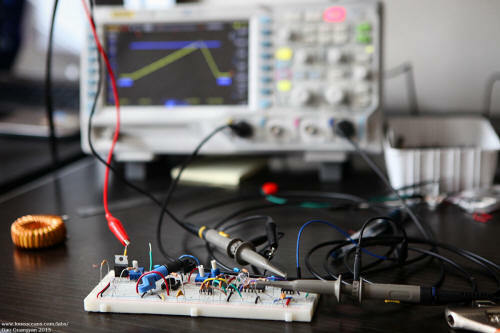 A tradeoff exists to use as few turns as possible without saturating the core and to minimize the leakage inductance, and increasing the number of turns to reduce the magnetizing current. This can be given by I_mag_rms = 0.577 * I_peak = 0.577 * Vp2p * period * duty / L, where L = AL x N^2. With the coil ready to go, I use a small 940uF 400V capacitor as the bus cap and started testing the DRSSTC to make sure the driver is working and is tuned to perfect zero current switching. I'm using the same 8-TO247 IGBT 'easyBridge', same as the one I used in QCW 1.0. These use the fantastic Warp2 series IGBTs from IR. The driver is the usual UD2.7C. 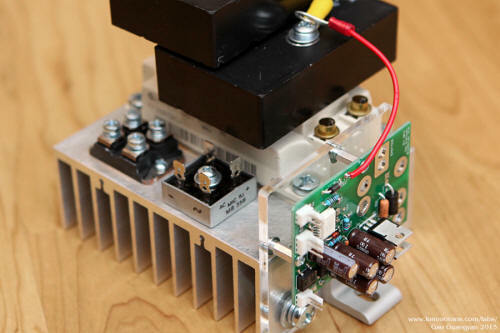 Note that addition of a very large 35V 5600uF capacitor on the 24V rail - this is required due to the long pulses required for driving the IGBT gates during QCW operation. 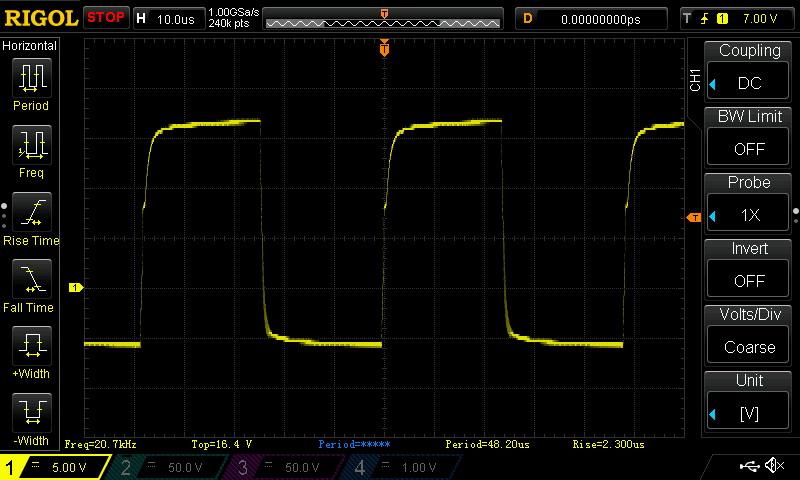 During each QCW pulse, the transistors will be switching several thousand RF cycles. It is important to keep any switching losses and switching spikes to a minimum. I carefully tuned the driver for perfect zero voltage switching. The four scope shots show the primary current (pink), Vge (yellow) and Vce (cyan). In the top two, there is insufficient phase lead. 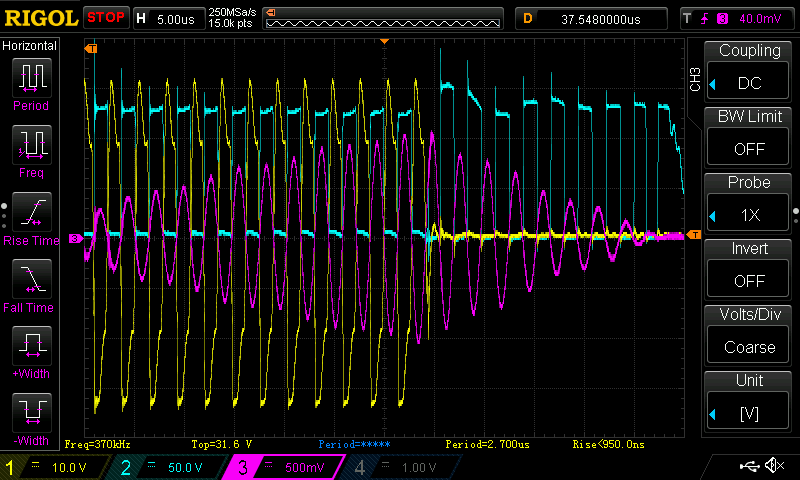 The current in this case is just about 50A, but even with the bus at 100V, we are seeing spikes (cyan) of almost 100V due to slightly late switching! The bottom two photos show the result after phase lead adjustment. Here the primary current reaches about 110A or so with 128V on the bus. Despite this, switching is perfect with no switching spikes. 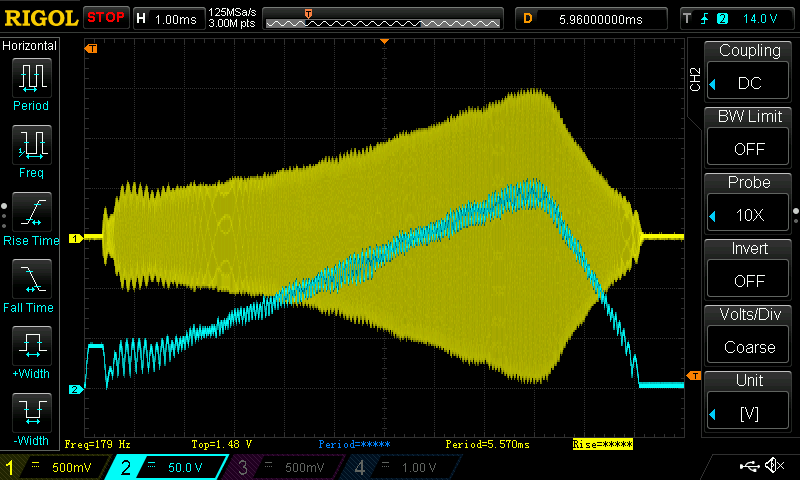 As a result of the clean ZCS switching, there is also a lot less switching noise and EMI - compare how clean the bottom trace looks like compared to the top trace. Here the coil is tuned at 360kHz. On to the bus modulator! The bus modulator is the heart of the QCW and what differentiates it from a normal DRSSTC. 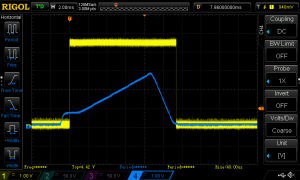 There are a few ways of implementing this (see my original write up), but I am implementing it as a high-current buck converter that feeds a rising voltage bus into the inverter input. I have used a simple asynchronous buck converter topology due to its simplcity. As mentioned, the main switch comprises of an IGBT in a half-bridge 300A module, and the catch diode being the reverse diode in the other half of the module (with the IGBT not being used). To drive the main switch, we need a proper gate driver. As a fun engineering exercise, I developed a new proper general-purpose brick driver for all my brick driving needs. This really isn't required though. 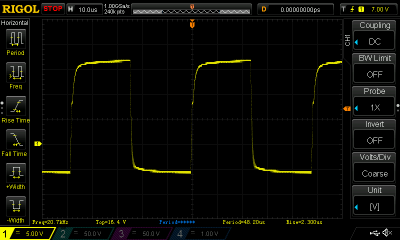 For comparison, my previous implementation used a FOD3184 for the buck switch's gate driver which worked just fine. But it's always fun to try to do something new :-). My new brick driver is based off an industry standard Avago HCPL-316J / Fairchild FOD8316 opto-isolated IC with fancy features such as complete integration and opto-isolation, 2.5A gate drive, de-saturation detection, fault feedback, under-voltage lockout and so on. 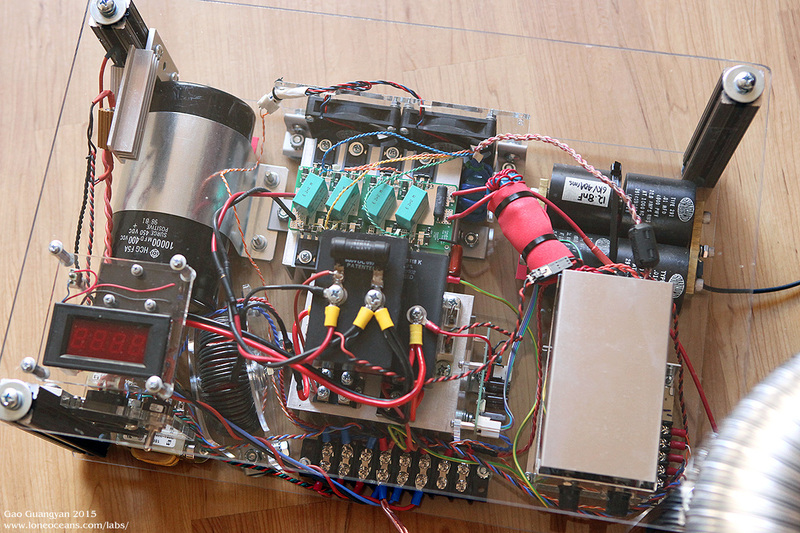 This was configured with a push-pull transistor output buffer stage to boost the gate drive capability to something like 20A capability, driving the gate with conventional +15 -8V drive voltages. In the event of a fault, I have configured the driver to automatically reset which occurs at the next gate drive low signal. The cool thing is that I've developed this driver to be as general purpose as possible, and I'm happy to say that it will be making its debut in this project! I'm sure I will find a lot more uses for it very soon in future projects. I routed the PCB after designing the circuit. Notice how it has an array of mounting holes to fit a variety of IGBTs. The entire assembly was mounted on a heat-sink together with the main rectifiers. 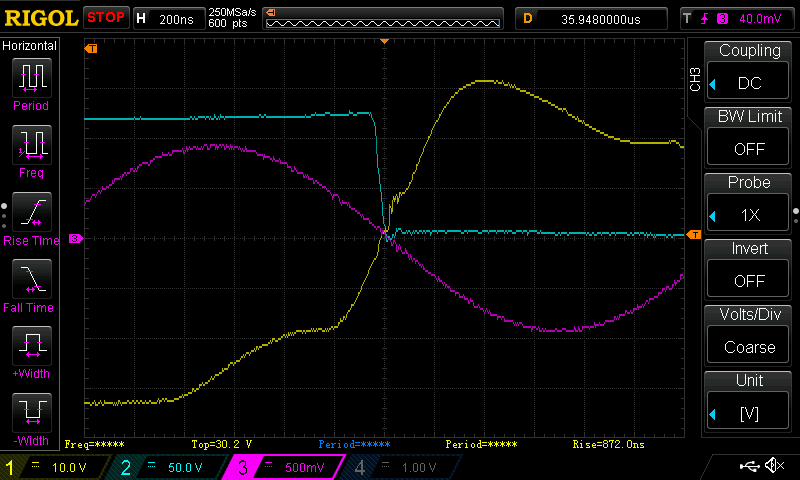 Above shows an early test (Vge) when driving the FF300R12KS4 (3200nC gate charge) with R_on of 4.7 and R_off of 2.0 ohms in addition to an internal 1 ohm R_g, at a 20kHz 50% duty-cycle. The miller plateau is very obvious around 8V. The resistors were later reduced in the bus modulator for slightly faster turn on and turn off speed, but at the cost of higher EMI during switching transitions. The buck switch was mounted on a single heatsink with its own integrated rectifier and 20uF buck output capacitor. Using a single module simplifies physical construction and reduces circuit inductance. Care was also taken to minimize inductance on the power rails just as one would do when constructing any other power circuit. The bus modulator controller relies on the same bang-bang feedback control I used in the version 1.0 modulator for regulation. However it has a few new improvements - added several adjustment points which allow me to fine-tune hysteresis and feedback characteristics to increase/decrease switching frequency and therefore output ripple. It also accepts Bluetooth signal input! As per my previous implementation, the ramp generator is implemented via a ATtiny45 microcontroller with control potentiometers to adjust for the pulse width and ramp height, as well as generating the interrupter ON signal. This controller now also sits on-board for a more integrated solution. After writing the firmware for the controller, I programmed the IC and began testing the new integrated controller. The circuit was tested on a breadboard first before I routed a PCB for it. 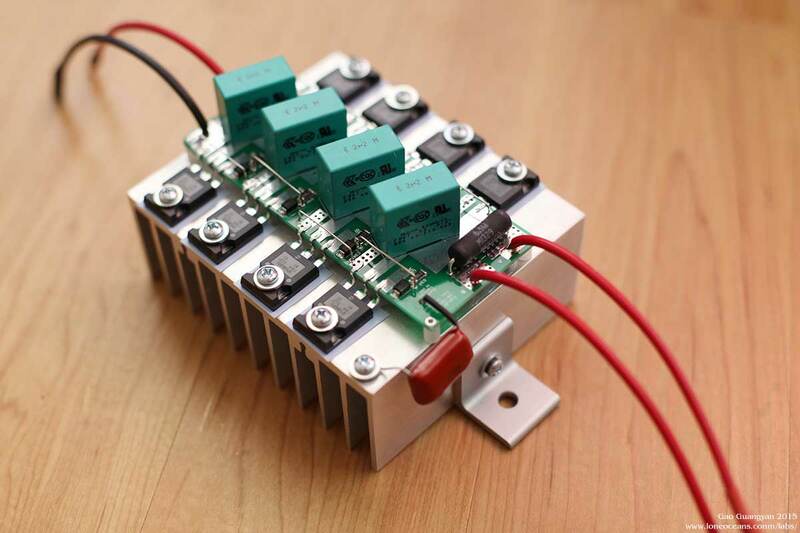 The control board also has a capacitor discharge and gate driver output, which can be used for switching a FET/IGBT to discharge the buck output capacitor after each pulse. This can be useful if an OCD event occurred and the output capacitor remains charged. Above you can see the output of the ramp signal, adjustable from 0 to a maximum of around 18+ms going up for 80% of the time and ramping down for the last 20%. In order to aid start-up, the ramp generates a step corresponding to around 40V for about 1ms. 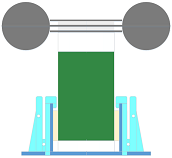 This 'wick' allows the coil to begin oscillation before the actual ramp, otherwise the coil would not be able to begin oscillating from 0V on the bus. From the scope images, note how I can increase the max height of the ramp while keeping the same gradient, and I can also adjust the pulse width of the ramp, while keeping the same height. 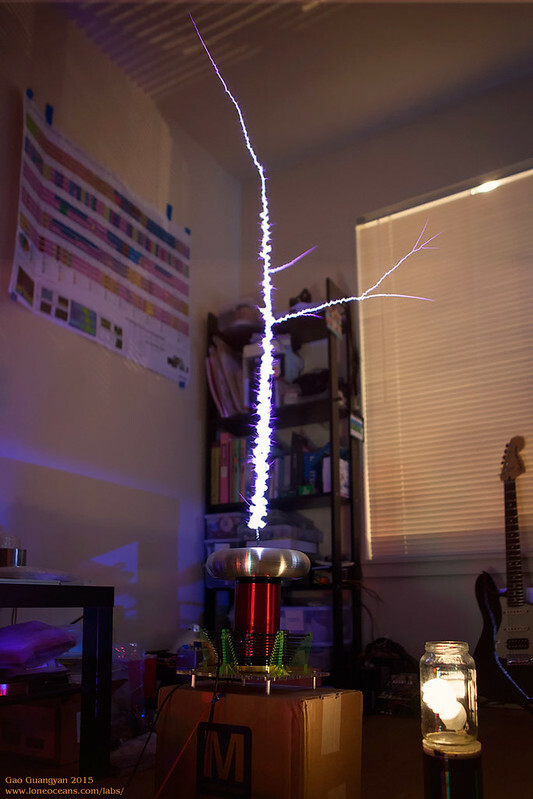 The yellow signal shows the logic signal to the tesla coil interrupter. It has been experimentally found that a linear ramp like this works great for spark growth, but this is no reason why this cannot be an arbitrary signal, for example an audio signal. In this way, the bus modulator can be used as a high power amplifier for musical CW-SSTCs. 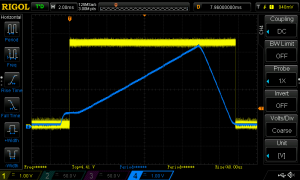 One technical issue to note about the bus modulator is that in the event of a current trip event, the sudden turning off of the bridge causes the (large) residual current in the buck inductor to have nowhere to go, creating an over-voltage situation on the bus of the bridge. If this exceeds the IGBT voltage, it will cause IGBT failure with horrible results! This is clamped using a high speed high current rectifier back to the bus caps. The output of the controller is sent to the brick driver, and buck output sense wires go back to the controller for feedback. The result is a modular and compact integrated board which I designed to be the same footprint as the coil driver, and hence fits easily inside the same shielded case. 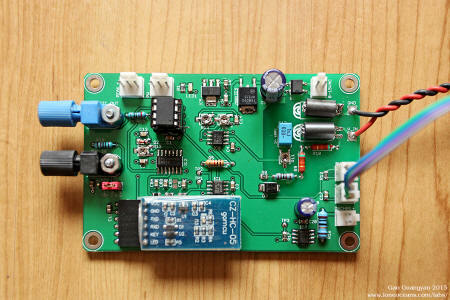 Control to the circuit is done via fiber-optic, but in a bid to further reduce wires, the board also accepts a bluetooth module for communication with a bluetooth device such as my smartphone via a simple application. This allows me to send pulses to the control board. To avoid any sort of EMI, the board locks out immediately after receiving the signal providing dead band immunity. For power-cap, I've also arbitrarily set the maximum possible pulse rate to just about 9Hz for a roughly 15% max duty cycle. Finally, I encountered some problems on and off with various components of the feedback circuit. First was mostly due to feedback noise, likely caused by noise pick-up during the hard-switch events in the buck. This manifested itself as a high frequency switching instability fed back into the regulation circuitry. It took me a while to figure out since simply probing the circuit exacerbated the issue. The final solution was simple managing my wiring properly, keeping feedback wire pairs twisted and reducing stray inductance, shielding everything in a grounded case. I also added a ferrite bead on the V+ feedback (adding one to ground had a very detrimental effect! ), and this solved all my noise issues. 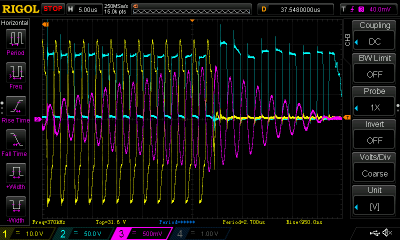 Secondly I messed up the common mode voltage inputs in my comparator - the TL3016! 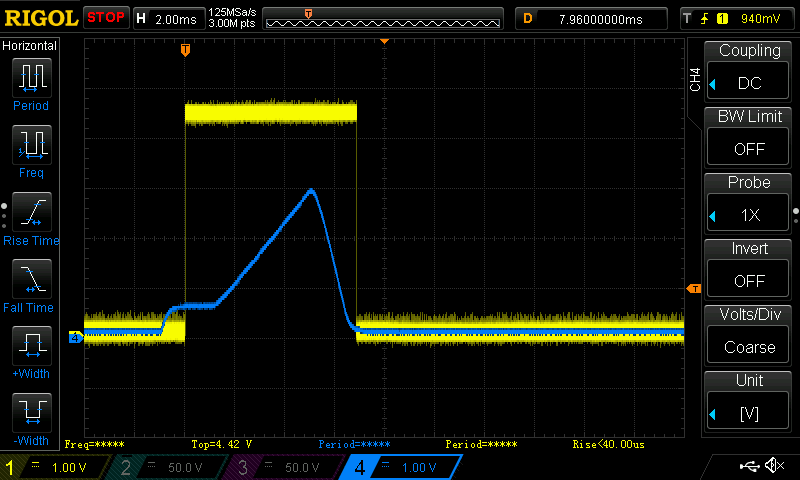 It turned out that the common mode input range with a +5V supply was 1.25 to 3.5V, causing the output to be very unstable at low voltage comparisons! I eventually replaced the part with a LT1719 device, designed specifically for low voltage operation, from 100mV below V_EE to 1.2V below V_CC. The LT1394 could probably be used as well. Regardless, this fixed all the issues I had with feedback resulting in beautiful clean operation (more scope shots below). After a good bit of on-and-off work, I wired up version 1.5 of the 'Buckverter' for it's inaugural run. For its preliminary test, I used a small temporary 900uF 450V capacitor charged up to around 400VDC as the bus capacitor, with a large 5 ohm resistor as the output load. After some small adjustments in the feedback of the coil and some debugging, the circuit worked great! 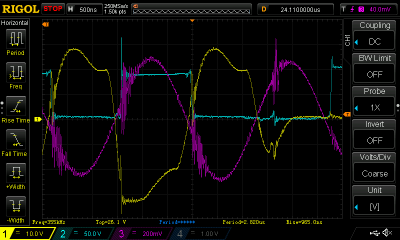 I've arbitrarily adjusted it so the max switching frequency in this test to be just about 17kHz. Above you can see the voltage across the load - a ~40V step going up to a beautiful ramp to about 315V, for a peak current of just over 60A and a pulse energy of about 30J. 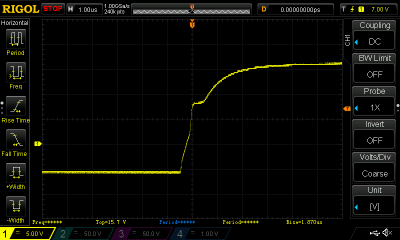 The peak was reduced slightly in this case due to the capacitor voltage dropping too much at the top of the ramp. With the output inductor of 113uH and a total output capacitance of 28.8uF, we get a cut-off frequency of around 2.8kHz. The switching frequency can be adjusted on the fly for better ripple performance since I had feedback trimmers designed into my buck control board. For the actual bus capacitor, I managed to acquire a Hitachi 10,000uF 400V (450V surge) capacitor which should be a big improvement from my 3150uF bus capacitor I was previously using in V1.0. The datasheet lists a ripple current handling capability of 49.4A, 19mOhm ESR and 24nH ESL. This will be used in actual QCW operation. With the bus modulator working as expected, it's time to put it together with the coil! My QCW setup was getting quite unwieldy being a bunch of components and wires all lying about on the floor. So I decided to make a very simple case for it so I can move it around easily, and so that it won't collect so much dust when sitting around. The box was simply made of some scrap polycarbonate sheets and aluminium supports, and measures just around 12 x 18 inches, making it reasonably compact. For safety, I integrated an on-board LED voltmeter panel which tells me the voltage of the large bus capacitor. I could probably have made it even more compact by some stacking of components but I think the overall result is ok. In the overview, you can also see the bleeder resistors, as well as a start-up bypass resistor mounted on a small heatsink if a variac is not used during start-up. First Light (and Experiment 1)! After a few weeks of restarting the project, I was able to put the components together for QCW V1.5's inaugural first light run. This was done with a new 34 AWG secondary. It all came together and the coil performed very well! This entire test was controlled by my phone via bluetooth - this worked a lot better than I had expected, and turned out to be very convenient! I also managed to catch a trace during this first test. 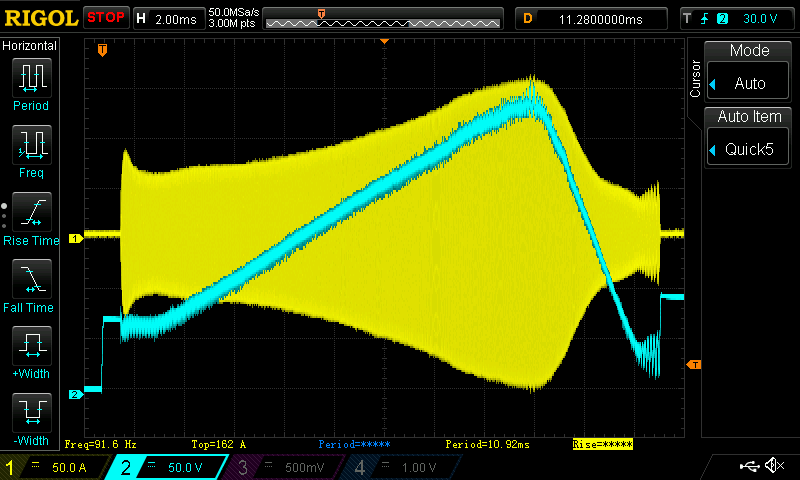 Blue shows the bus voltage and yellow the primary current throughout the tramp. At the beginning, there is a small pulse on the bus to about 50V where the 'wick' begins - here the buck regulation isn't that great, so it's something I need to continue to work on. Then the interrupter line is turned ON and the coil begins oscillation. 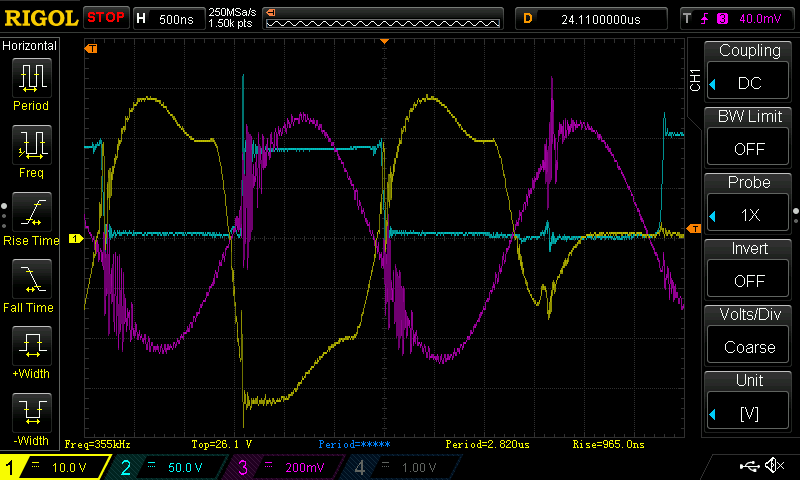 The buck switch frequency at the beginning is a relatively low 8.5kHz, leading to some quite large ~30V+ ripple. Correspondingly there is quite severe ripple in the primary current (starting oscillation 360kHz). 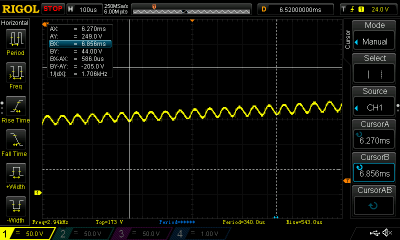 As the ramp increases, the switching frequency increases to 18.9kHz, with a much smaller ripple of around 20V. At the top of the ramp, the resonant frequency drops to 340kHz due to spark loading. Total pulse length is about 11ms long with a peak of just about 200V. Primary current peaks at just below 150A, and spark length is about 4 feet (120cm) long with the bus capacitor charged to just about 350V. Each pulse was measured to consume about 76J. At this point I've set the OCD to just over 150A as a bid to run 'within' the 75A pulse ratings per IGBT - turns out that this was about the maximum ramp I could use before hitting the current limit. Even so, performance is in line with Steve's 200A for 5 feet and 280/300A for 6+ feet. 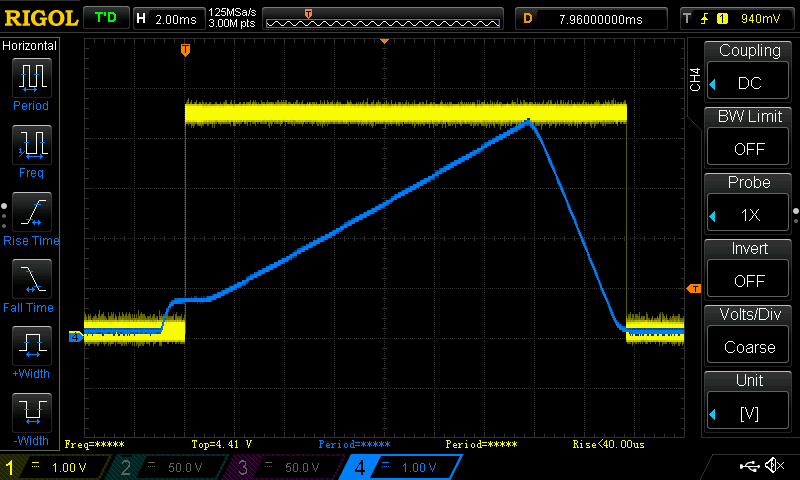 It seems like I was hitting 150A just around a 200V ramp input, so before working on the next experiment, I did some adjustments to my ramp generator to allow for a lower voltage but longer ramp. My hypothesis was that there exists a particular power ramp gradient where a ramp too low would produce knarly, segmented sparks, while a ramp too long would produce a really hot and fat but bushy spark. 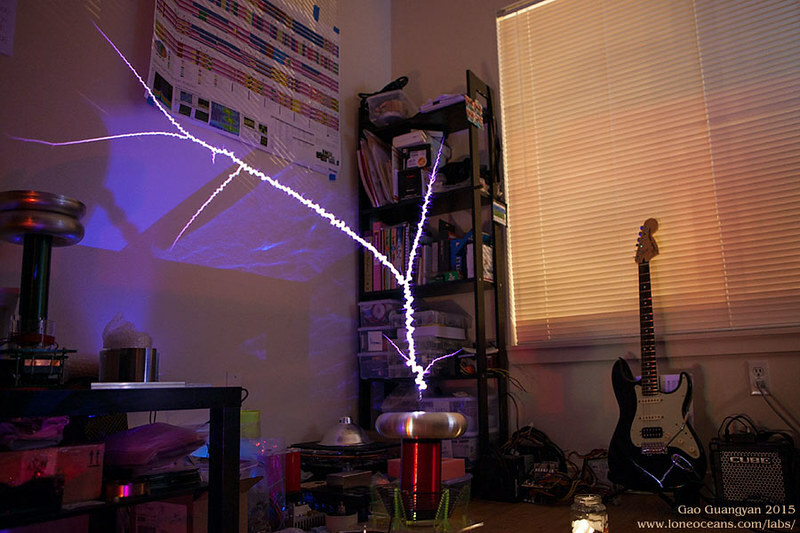 The idea is to ramp it just enough for it to grow long and straight to produce the longest sparks. It seems to work! The current was still kept just around 150A+, but the pulse width increased to 15ms. This led to significantly straighter and hotter sparks, though with not much improvement in spark length. 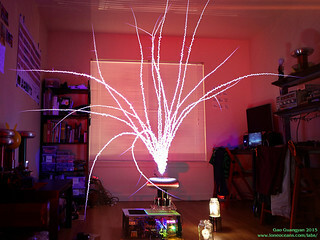 Increasing the pulse further made the sparks much fatter but no increase in spark length. It seems like generating 5 feet of spark would require 200A+, which should be capable with my current bridge. Time to begin with the next experiment with a large toroid and a system with higher coupling! Spark length is just about 4 feet, which is still unfortunately nowhere near the 60" required to break 10x secondary length! Experiment 2 - "FAT TOROID"
The new secondary coil design was doing quite well, but still not performing as well as I wanted. Based on my measurements, I went back to the drawing table, sat down and crunched some numbers. 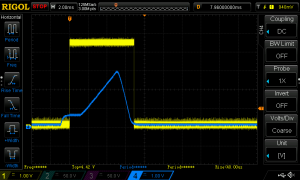 It seems that one of the main limiting problems of my current setup was due to spark de-tuning and insufficient coupling, causing a poor impedance match between the inverter and the spark load. So a new primary coil and toroid was constructed. After initial phase lead tuning at around 408kHz, I started testing the new setup. Initial results were very promising! For the first test for the new fat toroid system, the pulse was set to be 20ms long going up to around 250 - 260V, with a measured peak current around 125A. Even so, it was easily producing just over 4 feet, maybe 4.5' of spark. Buck switch frequency was around 9.6kHz up to 26kHz. The primary coil was tapped around turn 10.2, upper pole operation from about 413kHz to 386kHz and a pulse energy of around 162J (330V to 276.3V). Shorting the pulse to 15ms produced roughly the same results but with less overall bang energy. 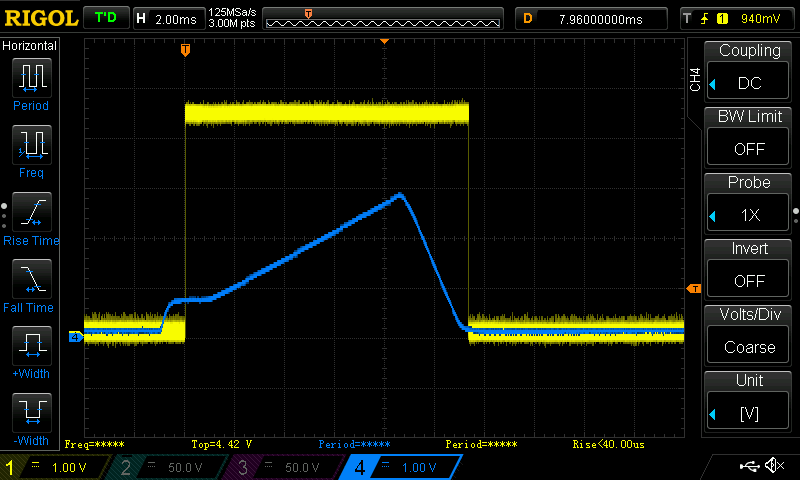 There is still headroom for more bus voltage, so the plan for the next test of Fat Toroid will be to charge up the bus capacitor to 400V (right on the limit) with a ramp reaching 325Vpk, which should give around 272J per pulse, and a max current should be around 160A. Hopefully this will allow for even better spark growth. After the promising results with the new FAT TOROID geometry, I tidied up all the wiring and did some tweaks. Previously my buck converter was glitching sometimes resulting in some unusual behavior, and I eventually found that the problem was due to me overlooking the input ratings of a comparator. 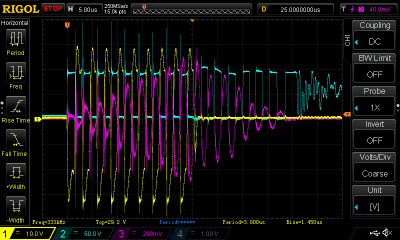 I fixed this problem and adjusted the buck feedback for higher switching frequency hoping to get a smoother ramp. This finally paid off, and I'm proud to say that QCW 1.5 is now performing about as well as I can hope for with the exact impedance match I was looking for, delivering 150A at its peak ramp of just over 300V. Spark length is now just over 70", and I have exceeded my project goals more than I could have hoped for with an almost 13:1 spark to secondary length ratio! 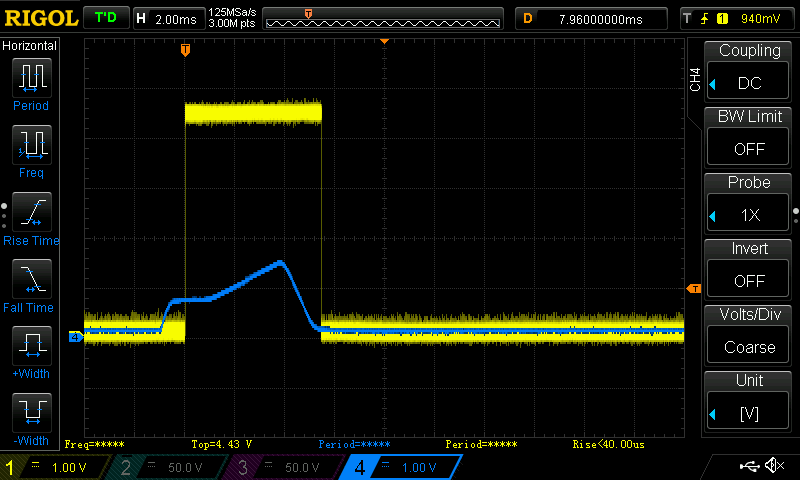 Running parameters are as follows: The bus cap is charged to about 385V with a ramp up to just about 300V (from ~75V). Peak current hovers between 145 to 160A, with an operating frequency starting at 413kHz dropping to about 377kHz with a ~70 inch long spark. The new buck switch frequency is around 16.5kHz up to 31.85kHz (really depends on operation though). Pulse duration around 22ms with a rising ramp around 16-17ms. Each pulse consumes about 275J. The primary current waveform is most interesting. There are still some further tweaks I will be making soon, including lowering the initial ramp. Right now the coil is running fairly reliably with excellent performance :). Above is a lucky single shot capturing a very beautiful straight spark. 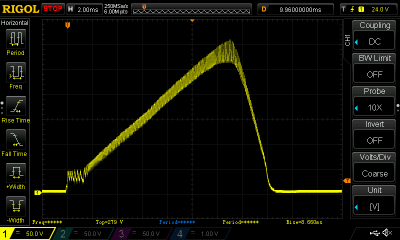 I'm sure I can tweak the ramp parameters just a few more inches of spark length output, but at this point I'm probably limited by my bus cap which is running out of capacity, so I think just about 6 feet is the limit at ~160Apk with this setup. At this point I think I can call QCW 1.5 complete! Thanks for following this page and be sure to check back for the next project. It's probably going to be a QCW 2.0 :-). See my original QCW 1.0 page for the original build.